We can create a spectacular dancing water display that combines the beauty of a fountain, the gracefulness of ballet and the excitement of a fireworks show. Our invention works equally well on a small or large scale and can be installed either indoors our outdoors. This makes them an incredibly versatile investment, bringing in large crowds to your business and generating revenue through admission charges if you so wish. We are the world leaders in dancing water displays with three generations of expertise dating back to the 1920’s. 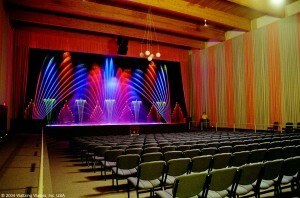 Space age technology brings these unique shows to life and their colours are up to four times brighter than regular fountains, meaning that indoor water light shows can be seen clearly day or night in an optimal environment. We are the best in the entertainment industry when it comes to value for money, quality and reliability – our family name and reputation depends on it! Our commitment to excellence drives us to provide clients with a perfect display and everything is tailored to your exact requirements. Liquid Fireworks dancing water displays will benefit both you and your visitors, with venues featuring our fountains boasting a very high rate of repeat customers. Around the world our water and light displays can be seen at Seaworld and Universal Studios and Disney parks as they are a proven crowd pleaser. Clients benefit from minimal maintenance and operating costs, with shows running for months at a time with virtually no service needed. Our productions are captivating, memorable and perfectly in sync, showing many colours and routines that utterly transform any venue. You can get in touch with the friendly team of experts here at Liquid Fireworks over the phone by calling (239) 574-5181 or customers are welcome to email sales@liquidfireworks.com and we’ll get back to you as soon as possible. The expertise of three generations comes with every Waltzing Waters ® show. My grandfather invented the first musical fountains over 70 years ago, and the family tradition continues today. In fact, we are the world’s only manufacturer dedicated exclusively to the development and construction of music fountains.